There is an increasing desire to have more content, more interactive options, basically; more bells and whistles available to enhance the experience of a visitor to a website. In January of 2008, HTML5 was first discussed and began development. It’s come a VERY long way since the very first incarnation back in 1993 with MOSAIC and was standardized for general use in 1995 with HTML2.0. One of the biggest and most desired options that HTML5 can offer the web designer is the VIDEO element. More and more companies want to display video quickly and easily as well as the general public for a variety of uses from promoting a product from an in-house production, a street journalist showing events they are raising awareness for and family members who want to have a special event preserved for a loved one. What you had to do pre-HTML5 was take the object itself, embed it, write complicated and time consuming scripts to show a video clip that could be perhaps, fifteen seconds long. Now, you can use the VIDEO element; which is supported on Opera, Safari, Firefox, Chrome and IE. HTML Video is no longer a necessary pain for your website development; it is now a useful tool that you can work in collaboration with production studios, videographers and the person on the street with a mobile to generate a website that will draw traffic, hits and connections to other work. The good, and *maybe* not so good part is that HTML5 is still in development. Another way of putting that according to experts is that it’s an evolving technology that will never technically be, ‘finished.’ The positive way to look at this is the advancement you have to work with now for video insertion and delivery are better than what you’ve had and it can get better from here. 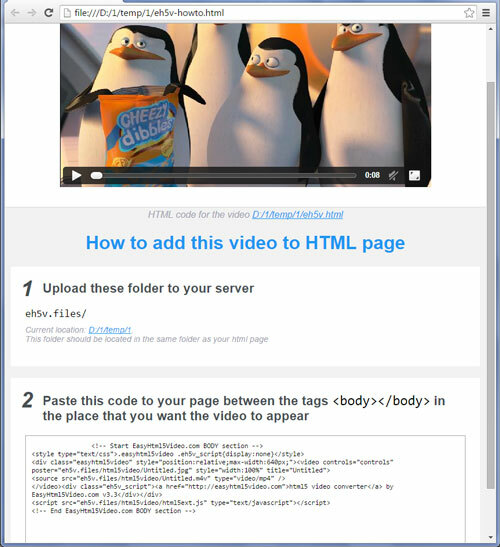 One great way to show what you can do with HTML video can be found at a site called EasyHTML5Video. This site will let you drag and drop your video file, hit ‘publish’ and you’ll get a page with all the codes you need for a seamless, attractive look for your site. Support is available for Android as well as iPads and iPhones. Use the free version for your personal pages or to get an idea of how the coding works or buy the pro version for your business and cut the time you need to edit your pages to show video content. HTML5 is here, it’s getting better and it’s what you need for effective video insertion and playback for your web presence.